The Advisory Board comprises ten members, all of whom are respected academics in various fields, with insights into research ethics, academic dishonesty, or field specific research ethics. The members of the Advisory Board are appointed by the Ministry of Education and Culture after soliciting nominations from universities and research institutions. In addition, TENK has a small secretariat. TENK is an expert body of the Ministry of Education and Culture, but to maintain its independence it operates outside the Ministry and all universities, polytechnics, and research institutions alike. While functionally independent, administratively TENK is affiliated with the Federation of Finnish Learned Societies. 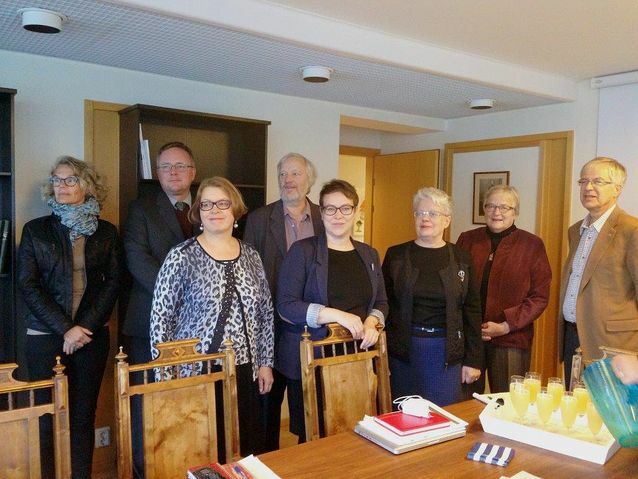 Directors and officers from the Federation of Finnish Learned Societies and its affiliated Advisory Boards (TENK, The Council of Finnish Academies, and The Committee for Public Information) on signing their cooperation agreement in 2013. Photo: TSV. Dr Spoof says that today the Advisory Board spends most of its time solving cases of academic dishonesty. The framework for the investigations is provided by the guidelines Responsible conduct of research and procedures for handling allegations of misconduct in Finland, or the “RCR guidelines,” issued by TENK. Every university and research organisation in Finland has committed itself to following these guidelines and reporting each and every detected or suspected case of dishonesty to TENK. The primary responsibility for investigating a suspected case of academic dishonesty lies with the research organisation or university under whose aegis the research was undertaken, but TENK has advisory and oversight powers. 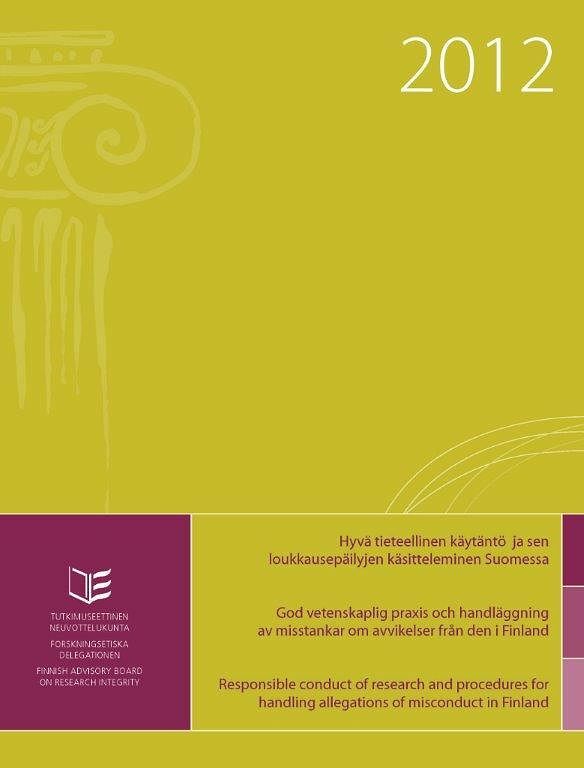 The guidelines Responsible conduct of research and procedures for handling allegations of misconduct in Finland by the Finnish Advisory Board on Research Integrity, adopted by every university in Finland. As Secretary General of TENK, today Dr Sanna Kaisa Spoof is the only civil servant in Finland who concentrates full-time on research integrity focused on responsible academic conduct. She is kept busy answering several daily requests and inquiries on the issue. Dr Spoof was originally thinking of a museum career, but it was not to be. Before finishing her Master's degree, she was already substituting for a research associate, and after that she had two full five-year terms as research associate. Then she moved on to university administration, and from there it was a short leap to research ethics. Dr Spoof was already intrigued by ethical issues as an associate, since one couldn't avoid encountering them in research and teaching.